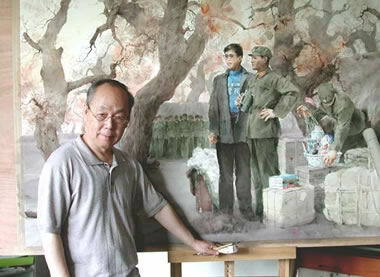 Guan Weixing was born in Dunhua County, Jilin Province, China in 1940. In 1960, when Guan Weixing was still a first grade student in Luxun Fine Arts Academy, Eugen Popa, a Romanian Professor, broke a rule in order to accept Guan into his oil painting training class. And in 1962, he was graduated a master. So far, many of his works have been published, collected, and exhibited not only in many national exhibitions but also in international ones held in America, Japan, France and so on. Among them, "First snow" won the gold medal in the American watercolor exhibition; "Friends" was awarded at 126th Annual International Watercolor Exhibition in USA, and was selected for the annual traveling exhibition. The book 《Memories of Peking: South Side Stories》, containing more than 80 illustrations by Guan Weixing, won International Best Illustration Award in 1992,1993 and 1994. Guan's accomplishment in watercolor is highly praised. His figures' structure is solid, the mould-making accurate, the style free and easy, the color elegant. His works, such as "Holy mother in the world", "First look at the world", "Autumn fun", "Old farmer from Shanbei", "Youth", "Guard", "Girl in full dress", "Child fun" have won him great fame worldwide. Some AWS members comment that he is a "great master", "among the best all over the world", "a very highly skilled and talented artist", and that "nothing can surpass his works". And he was selected as the only member from Asia to join the world famous watercolor delegation of ten top watercolorists, led by Leslie Worth, former president of English Royal Watercolor Society. Mr. Worth said he had never thought before that China has so excellent a watercolorist. "His works are fresh and elegant. Every picture is a lyric. They are a perfect combination of great talent and superb techniques." In 1996, as a delegated watercolorexpert of Chinese Culture Ministry, Mr Guan entered "Chinese Watercolor Exhibition"held in Tunis. Hisworks are thought to be "inconceivable", "watercolor magic", and "simply not achievable". A legion of admirers and followers thought his brushes were magical and collected all of the painter's paraphernalia. He was invited to give lectures in fine arts academy and made TV specials. The recently completed huge-sized watercolor "Villagers viewing opera" (200cm x 130cm ) vividly depicts dozens of simple and honest villagers, with different characters and various expressions of extreme life likeness. In October,1998, Guan's solo exhibition held in Beijing was second to none in the field and got myriads of recognition. Nowadays he is regarded as one of the most authoritative and influential watercolorists. In 2005, Guan Weixing held a solo exhibition for the first time in USA at the invitation of Ambleside Gallery, and it was a great success. The viewers moved to tears were even more than those at home. The local TV station produced a DVD introducing his art and his painting process, the radio station interviewed him, and a writer edited a book for his works. Some comment goes like this,”Mr. Guan doesn’t belong to China, or America. He belongs to the world. He is the master of art in the world.” The viewers collected many of his works at high prices. During the exhibition, one of his works, “Aged Man” won the award “Former President Award” of the 85th National Watercolor exhibition, and because of that Mr. Guan was honoured as the member of American National Watercolor Society. He was respected and well beloved by American people. 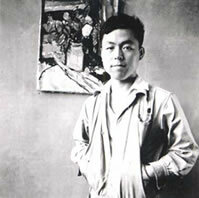 In 2007, Mr. Guan Weixing went to America to hold his exhibitions in New York, Houston and Greensboro. Just like before, his works were also highly praised and the viewers strongly hope they can enjoy more of his exhibitions soon. Now Mr. Guan Weixing is represented in the US by Ambleside Gallery ( http://www.amblesidearts.com ). At present Guan Weixing is director of China Fine Arts Association, vice president of Chinese Watercolor Association, juror of National Watercolor Exhibition, and titled national-level master of fine arts.